Today had two halves that were quite polar opposites. We started out the morning with 8mi on the JMT up through LeConte Canyon. It was quite a climb of about 3,000ft. 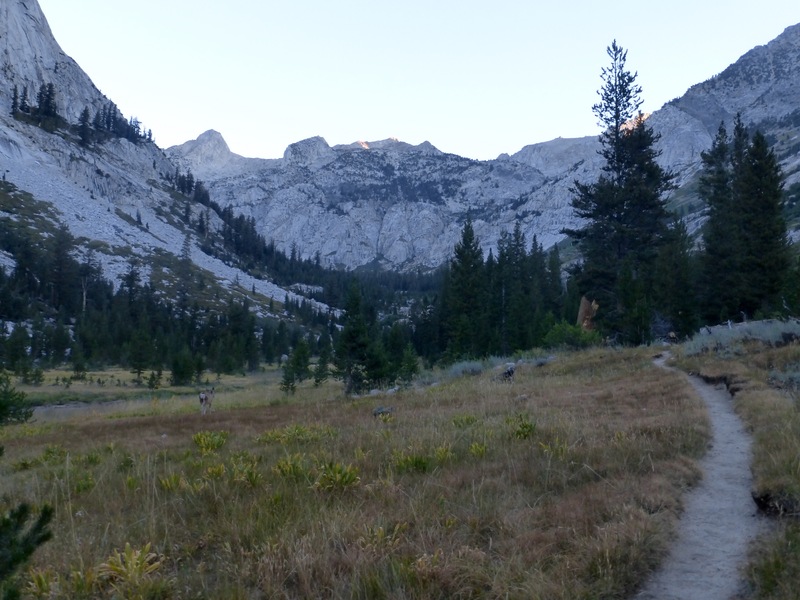 We started at 6am, and each hiked on our own agreeing to meet at Helen Lake, where our route leaves the JMT. We enjoy being able to hike some solo, even if it is just 5mins apart, so it was nice to get that solo time this morning. Morning in LeConte Canyon. 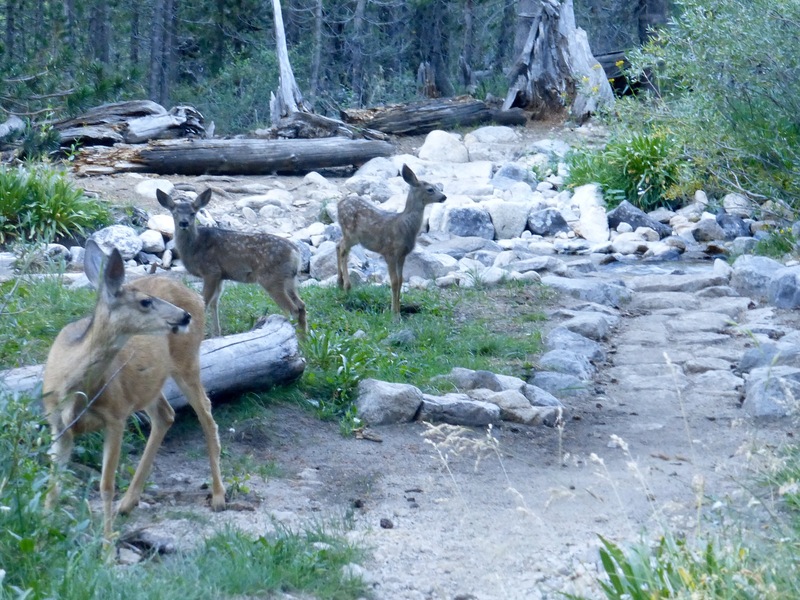 Notice the deer on the left. Again, I saw plenty of other hikers. I passed countless tents this morning and didn’t see anyone actually hiking til closer to 8am. I saw 43 hikers (13 women, 30men), 6 deer, and 4 horses. 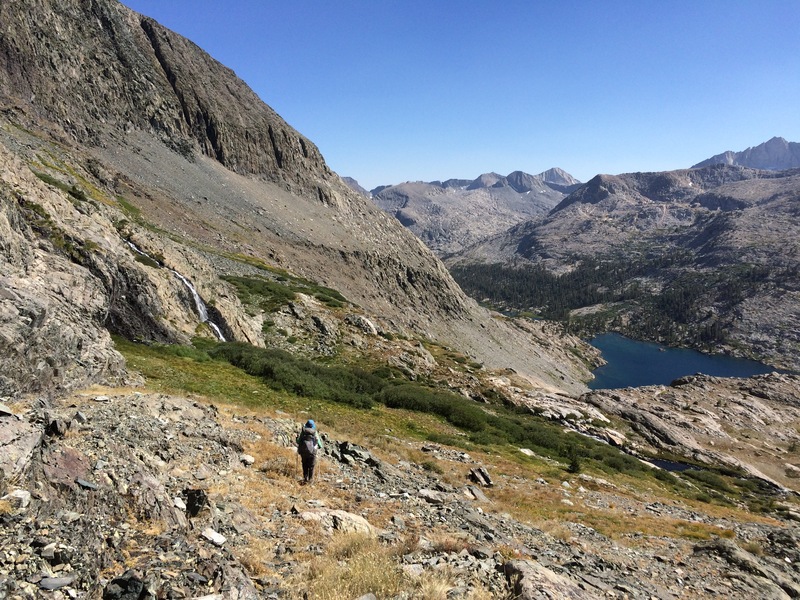 Yep, no lack of action along the JMT. I did have a man recognize me from the blog when we crossed on a set of switchbacks. He stood confused for a moment and said, “Are you Erin? Shouldn’t you be in Wyoming! ?” He was doing the SHR with his son and had read up on it through the blog, which was fun. 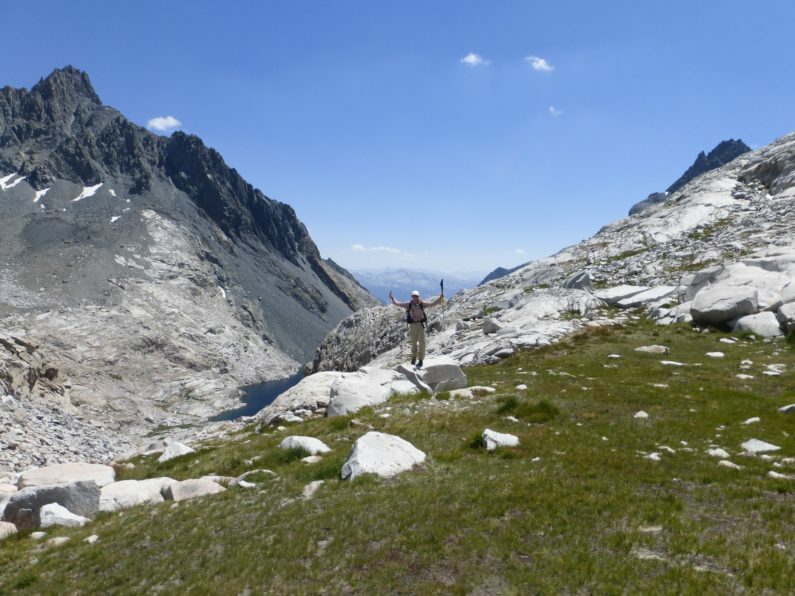 I do have to say that this summer I’ve seen the most diversity in hikers ranging greatly in all ages, genders, and races and that’s been pretty cool to see. 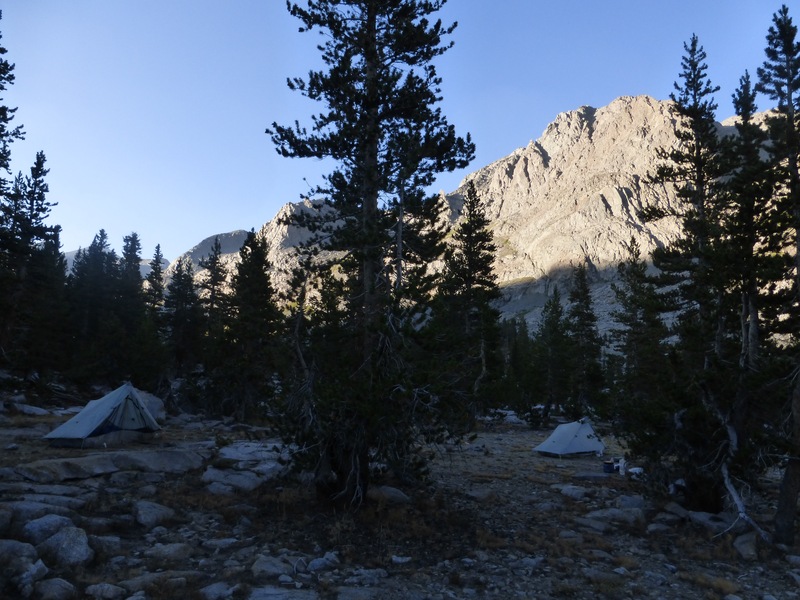 More of LeConte in the morning south of Muir Pass. 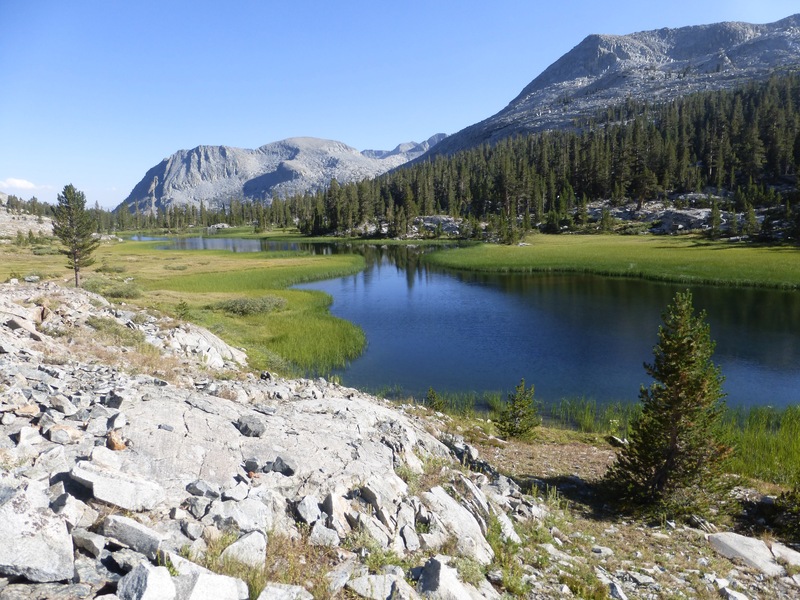 Earlier this summer, on June 29th, I hiked this section of trail when I was on the Sierra High Route. I really like LeConte Canyon. 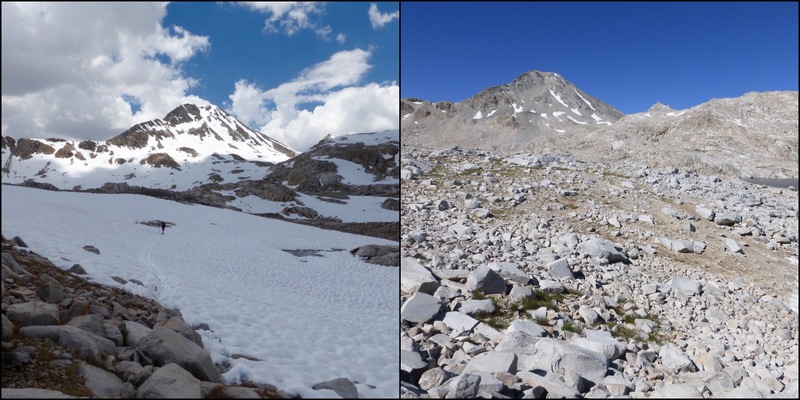 Since it was early season, we had snow at the beginning of the summer and it was fun to compare the photos to what it looked like just six weeks ago. 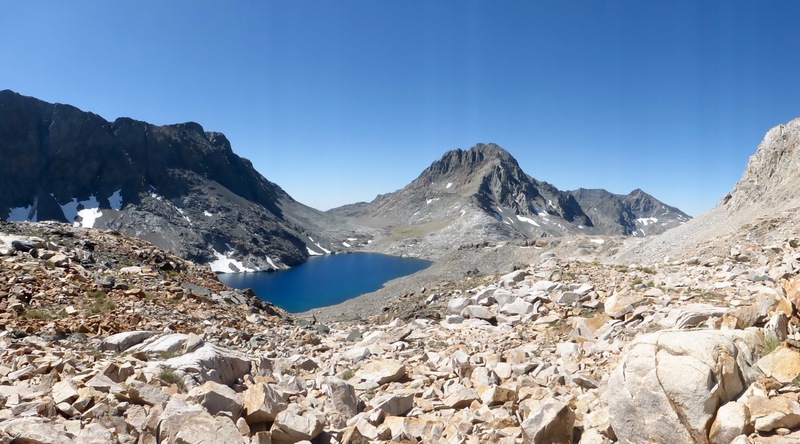 Comparing the JMT up to Muir Pass to what I hiked earlier this summer. 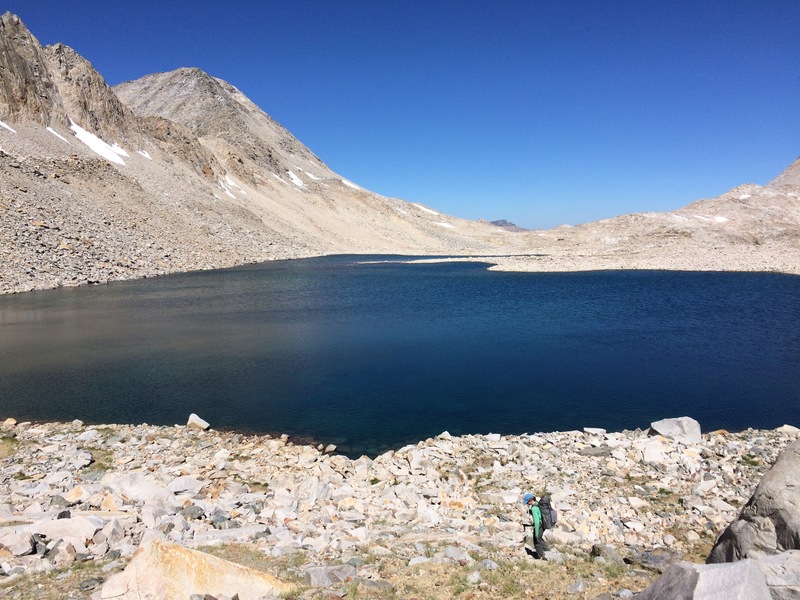 Once we got to Helen Lake, just before Muir Pass, we headed off trail to Black Giant Pass. 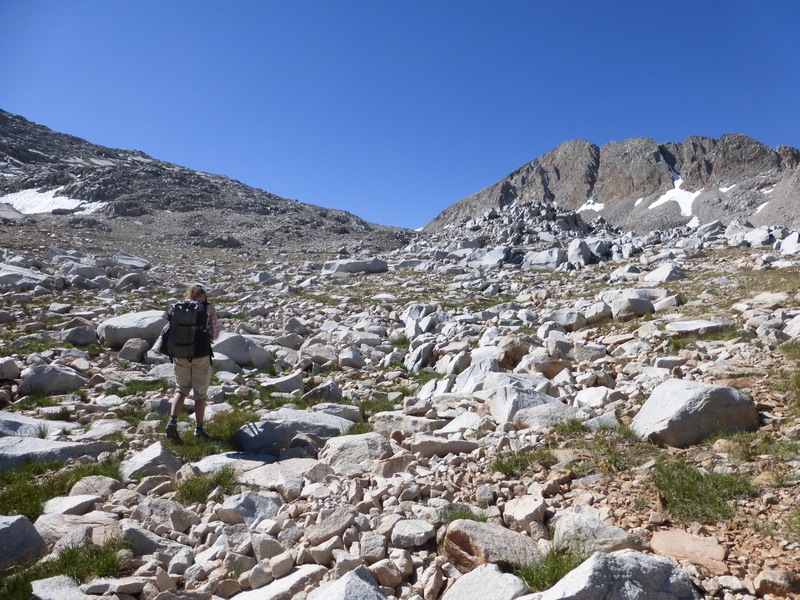 It was a simple pass just a mile off the JMT. Heading up Black Giant Pass. 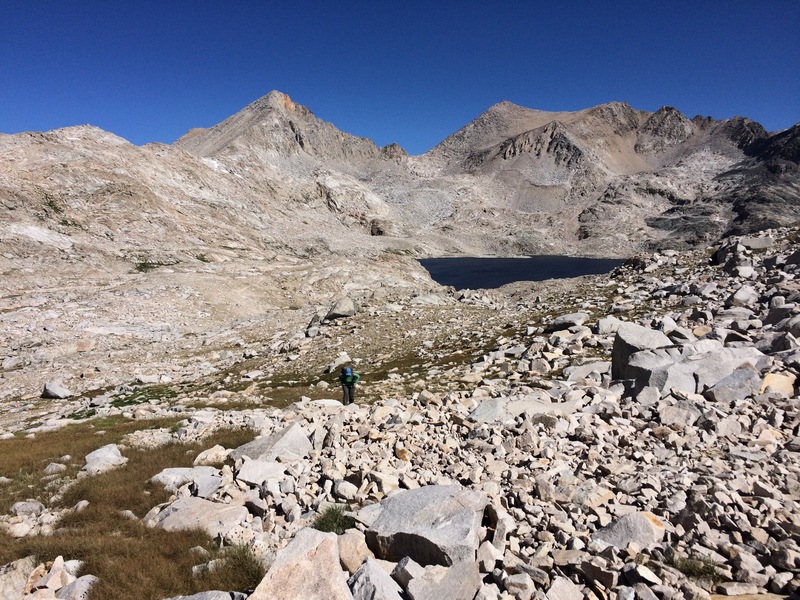 Looking back on the JMT. 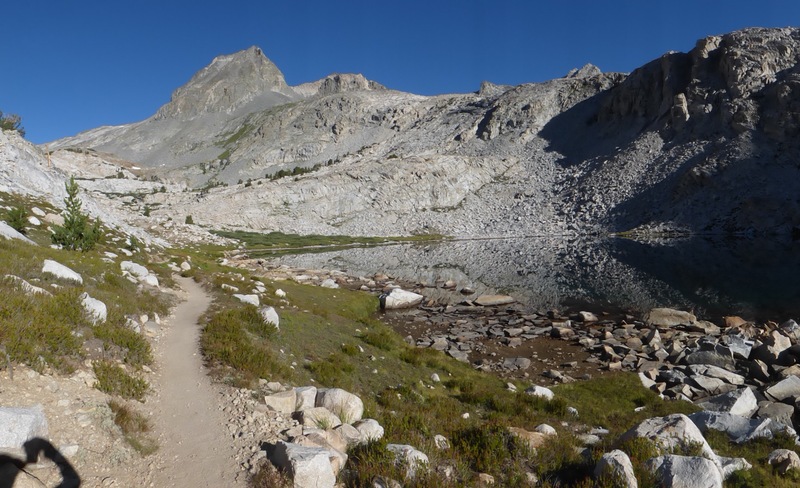 A cool sight to see on the way up was that we were across from Muir Pass and the John Muir Hut. We could see it in the distance. It is less obvious in a photo, but it’s right in the center in the distance. See the John Muir Hut? Click on the photo for full size to zoom in. Once over Black Giant Pass, we rounded the corner to enter Ionian Basin. View from the top of Black Giant Pass with Black Giant Mountain on the left. Ionian Basin is one of those seemingly legendary types of places. It has a Greek mythology theme to all the names. 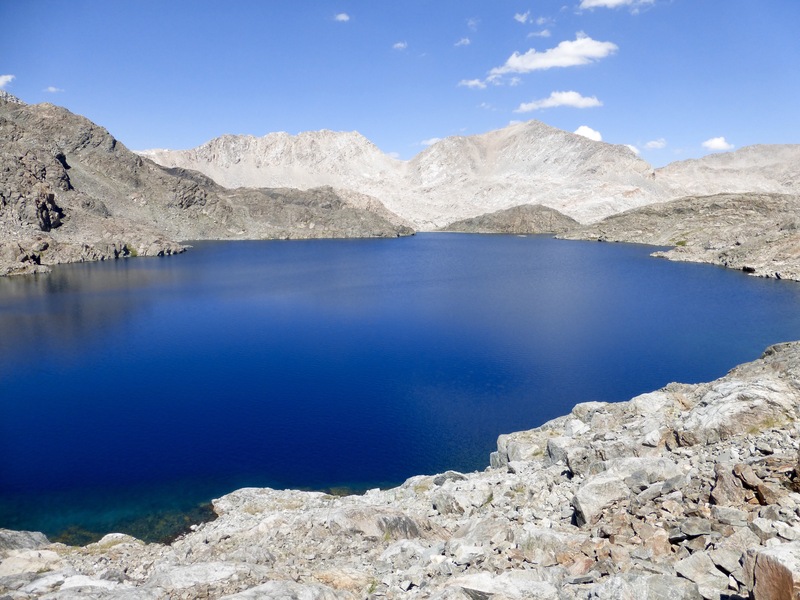 The ones on the map were Chasm Lake and mountains Charybdis, Scylla, and The Three Sirens. 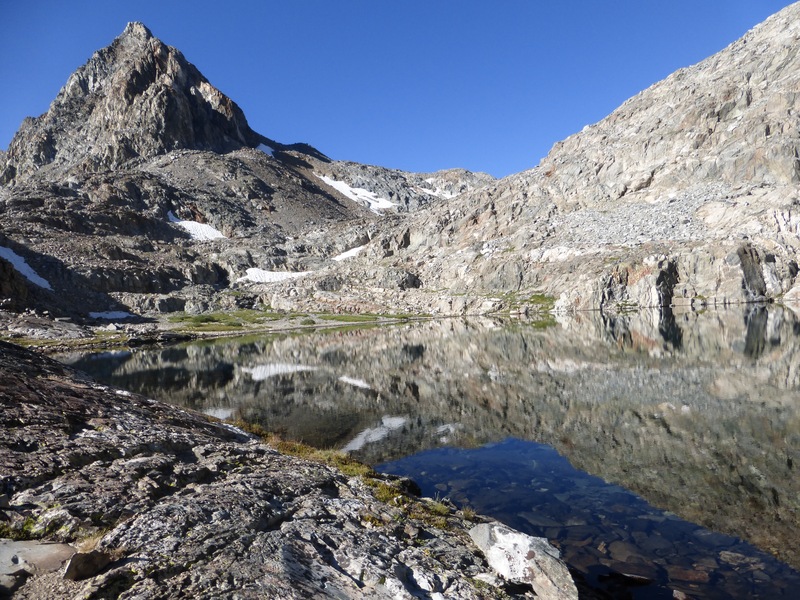 Looking at it on a map or on GoogleEarth, it looks quite magical with many lakes…but the catch is that it’s covered in talus and it’s very slow travel. Entering Ionian Basin around the corner from Black Giant Pass. E on the left. We were in Ionian Basin for the majority of the day and it was quite tedious in my opinion. Not my favorite terrain and I had hoped for more after the build up I feel like it had gotten from others. It was a ton of rock and the lakes were really nice, but it wasn’t the type of place where you felt like lounging. At lunch, we were pretty darn proud to have found a rare shaded spot in a rock. It wasn’t super hot out as we hiked, but it was quite intense sitting out on those rocks. Our lunch spot in Ionian Basin. We found shade! I think I might be trying to fight something off as I haven’t been 100% with energy the last couple days and have had some gurgling in the stomach and achy-ness in my joints and back like a flu, but nothing strong. Today I really wasn’t feeling it and found the terrain frustrating. My bad ankle wasn’t a fan either. I know it also may be the cumulative effect of being at the end of hiking high routes for the better part of two months. Lake Chasm, with Charybdis left and Scylla (and the Three Sirens) on the right in the back. E “between Scylla and Charybdis” above Chasm Lake! After a few hours in Ionian Basin, we entered the beginning of one of the more dreaded parts of this route, the rough and brushy Goddard drainage. We will be following Goddard Creek down canyon for about 10mi and dropping 6,000ft. Tonight, we did the first couple miles and it was quite a drop to do at the end of the day. We did have a quick fox sighting from high above as we got to see a fox run across the valley floor. 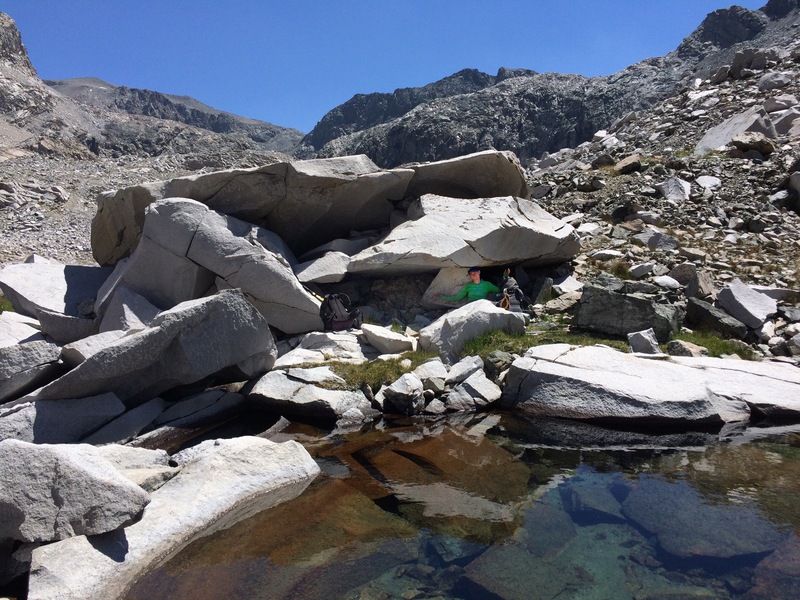 Dropping down from Ionian Basin into the Goddard Drainage. Some nice walking (for the last time) along Goddard Creek. 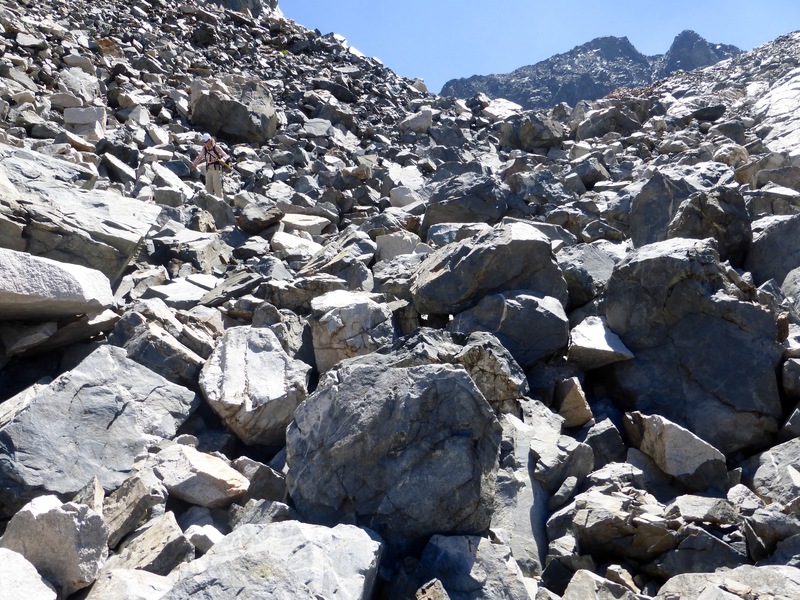 It was slow going on sloped rock slabs, loose rock, and tall grass. We knew that as we headed down, the terrain would get slower and the brush would increase. We saw good camping at 6:10pm and couldn’t pass it up. We decided it was better to stop a bit early than to get stuck with limited camping options later than we’d like. Plus, it was a tiring day and we both are quite happy to get the extra time off our feet. 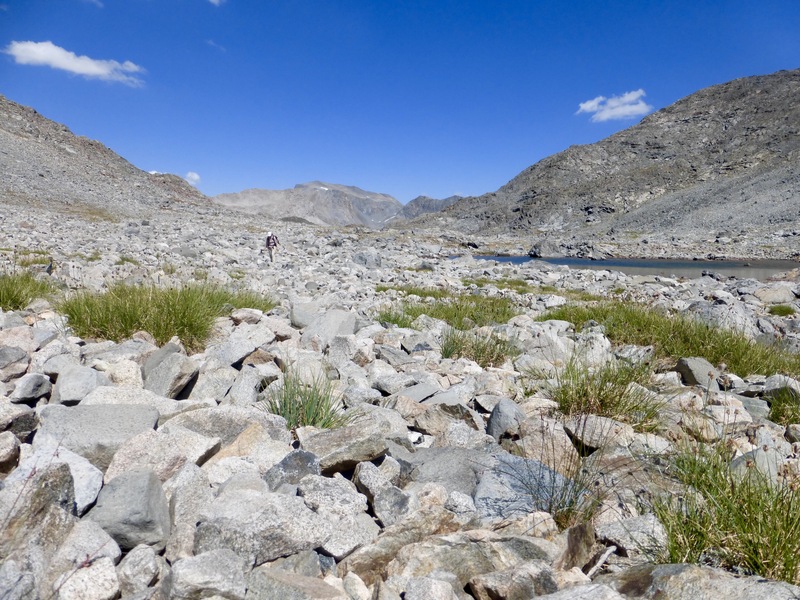 Tomorrow, we continue the increasingly slow descent down Goddard Creek. Aww, man, you have not posted the next day yet? Was really looking forward to how it went for you. Really tough section, especially below the co fluency with Enchanted Crk, but at least you are going downhill. Hopefully you learned how to follow game trails. Haha, it goes up tomorrow. Just a teaser. We’ve done plenty of bonding through bush whacking on the Great Divide Trail last year. We “bonded” quite a bit more going down Goddard, ha!